RECON-class Mjolnir, also designated as the MJOLNIR Powered Assault Armor/R variant, is a stealth-oriented variant of the MJOLNIR Powered Assault Armor that was originally commissioned by the Office of Naval Intelligence and developed by the Materials Group, with the GEN2 version being manufactured by the Imbrium Machine Complex. The visor used was the B5D-R/Optics Suite. There is also a non-Mjolnir version of the Recon variant used by ONI, the ODST S-1/ONI Recon BDU. A prototype was created prior to the Fall of Reach concurrently with the Mark VI Prototype. Field tests from the armor where to improve the final model. But the armor was already shown to reduce armor silhouettes without decreasing survivability. The Recon armor was developed parallel to the Scout armor in the Office of Naval Intelligence's Beta-5 Division Ordnance Testing Facility in Swanbourne, Perth, Western Australia. The armor was designed to provide the wearer with stealth capabilities and with little or no loss of endurance, specifically by reducing its infrared signature, reflective surfaces, and Cherenkov radiation emission. 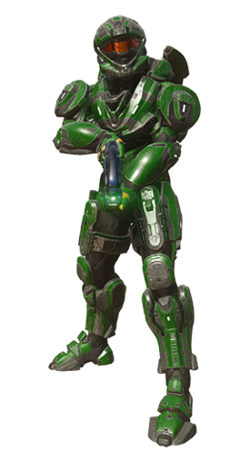 SPARTAN-B312 applied to use the Recon armor in its Mark V testing phase, and was given permission to use it. ONI operative Veronica Dare wore the S-1/ONI Recon BDU version of the helmet. Mark V Recon prototype variant. Upgraded Mark V Recon prototype variant ordered by SPARTAN-B312. The helmets visor system was changed to a APL-72 visor system. The chest has a infrared signature modulator, and a X900-Boulder emission shroud (IMC-spec). The reactor pack has a Bravado-120-B4 fitted stabilizer for masking reactor footprint. It offers improved movement stabilizers and adjustable shield distribution channels for versatility during deep-field reconnaissance. The GEN2 Recon helmet also contains a highly-classified Auspex battlenet uplink featuring state-of-the-art ONI counter-cyberintrusion and firewall routines. The armor itself is fitted with emissions baffling and plasma electronic support activity sensors for observation missions behind enemy lines. The greaves are an off-market system that feature exposed shield conduits. As a result of the UNSC Ordnance Commission in 2553, Imbrium Machine Complex took over production of the Recon variant after the Human-Covenant War, where they refined and improved the existing architecture. The GEN2 variant was tested at Anakara Resiliency Chamber with it being quickly done, as by January 2553 a copy of the armor was onboard the UNSC Infinity. Most operators indicate the armor has a notably higher resiliency and much leaner reaction-time margin. In the post-war era, custom-built upgraded and up-armored RECON [GEN1] helmets remain in service with individual ONI operatives. Such helmets, equipped with cutting-edge stealth and cyberwarfare suites, were used by ONI teams responsible for information sanitation operations on Created-occupied Earth. Unlock: After March 2012, Recon was unlocked for online profiles by default. Previously, it was unlocked by Bungie staff as a gift to specific players of merit, until the complete set of Vidmaster Challenges of Halo 3 and Halo 3: ODST were introduced. Then, it was unlocked by completing the Vidmaster Challenges and clicking "Unlock My Recon" in Bungie.net Service Record. Helmet description: The Mjolnir VI/R variant was developed concurrently with the Mjolnir Mark VI Powered Assault Armor. The goal was to increase stealth capability without impacting endurance. 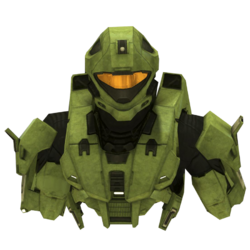 Shoulder description: In developing the Mjolnir VI/R variant, the goal was to increase the armor's overall stealth capabilities with little or no loss of endurance. This was achieved by relying on several tried-and-true methods. Chest description: In developing the Mjolnir Mark VI Powered Assault Armor/R, the emphasis was to increase stealth capability, specifically by reducing it's IR signiture, reflective surfaces, and Cherenkov radiation emission. The MJOLNIR, Prototype[R] is being developed concurrently with the Mark VI MJOLNIR PAA. Description: Data gathered from these field tests will be used to improve the final production model. Description: External hardened uplink for MILINT acquisistion; reserved for sensitive OPs. Description: Up-armored variant with hardened 3rd-generation uplink module for MILINT acquisition. Description: The MJOLNIR[R] prototype reduces armor silhouette without decreasing survivability. Default unlock: Obtained by achieving Spartan Rank 26. Surge unlock: Complete the Covenant Loadout Mastery commendation. Description: Ankara's reowned IMC took ownership of RECON production after the war. Helmet description: ONI teams responsible for information sanitization operations on Created-occupied Earth have access to cutting-edge stealth and cyberwarfare suites. Among these tools are upgraded and up-armored RECON [GEN1] helmets custom-made for individual operatives. Helmet description: The heavily classified Auspex battlenet uplink in the RECON helmet contains the latest counter-cyberintrusion and firewall routines from ONI. Body description: RECON armor is fitted with emissions baffling and passive electronic support activity sensors for observation missions behind enemy lines. On 7/7/09, players that beat a team of Bungie employees in Matchmaking were awarded Recon Armor. Unlocking the Vidmaster Endure Achievement will unlock Dare's Recon helmet as a wearable "hat" for the player's Xbox LIVE avatar. On March 31, 2012 Bungie.net transferred all Halo 3 and Halo: Reach record-keeping to Halo Waypoint. As part of the transition Recon armor was unlocked by default for all online Halo 3 profiles. BDA is a military acronym for "battle damage assessment", ITG is "Initial Terminal Guidance", and RSO can mean both "Range Safety Officer" (in rocketry) and "Radiation Safety Officer". The Recon armor in Halo 3. Captain Veronica Dare wearing an ONI-issued variant of the ODST armor with a Recon helmet in Halo 3: ODST. Dare's Recon helmet with its visor depolarized. Concept art of the Recon helmet for Halo: Reach. The first render of the Recon helmet appearing in Halo: Reach. A render of the Recon helmet in Halo: Reach. The Recon base in gameplay in Halo: Reach. Recon, with the UA/HUL attachment, in Halo: Reach gameplay. Concept art of the Recon armor for Halo 4. Three-dimensional models of the MJOLNIR (GEN2) Recon helmet and torso armor. Three-dimensional models of the Recon leg armor. 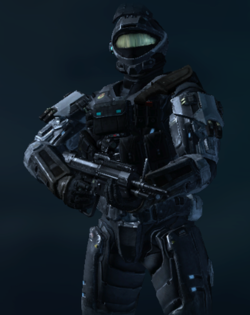 Front render of the Recon armor in Halo 4. Spartan Anthony Madsen wearing GEN2 Recon armor during the Requiem Campaign in Spartan Ops. Yeong-hao Holst in his Recon armor in Halo: Initiation. Spartan Newman wearing GEN2 Recon armor during the Battle of Ealen IV in Halo: Escalation. The Recon helmet in the Halo 5: Guardians Multiplayer Beta. The GEN 1 Recon helmet in Halo 5: Guardians. A Spartan-IV wearing GEN2 Recon armor preparing for War Games in the HCS season 2 trailer. REQ Card of the Recon helmet - BDA variant. For a complete list, check out our Armor directory. For a complete list, check out our MJOLNIR Armor directory.